Hey, it's Jenna. 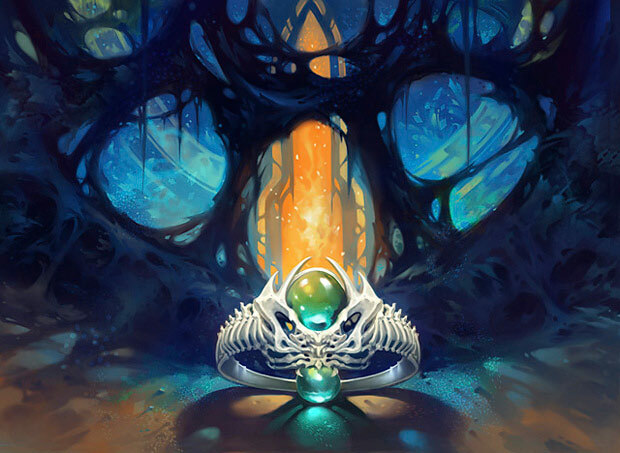 In general, our plan is to explore a new card and a new story each week. 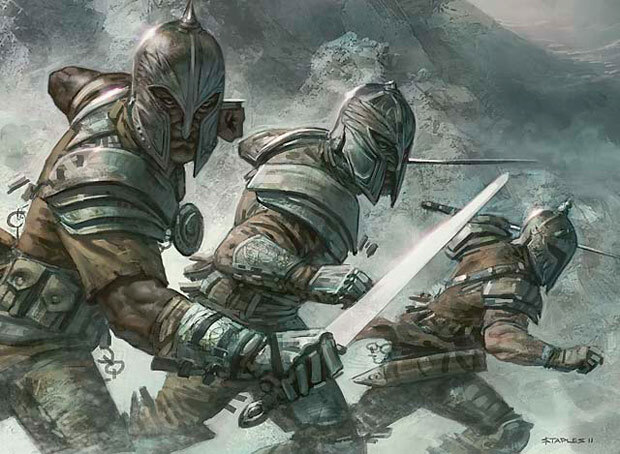 We got a lot of feedback from people who want to hear more about Garruk, so we'll continue his story soon. But today, we're putting the scope on the mountains at the border of Thune in Shandalar. Thanks for reading! East of the border, I am called Sentos the Merciful. West of the border, I am called Sentos the Righteous. In the place where east meets west, I am just a man. A man alone in a monk's cottage in a monastery deep in the borderland mountains. A man twenty-six years old and the veteran of a war that started the year I was born. An hour to the east is An Karras, the city of my birth. It's an ancient city, so old that the dust between the flagstones is the remnants of temples built in its infancy. There, my parents, my wife, and legions of admirers would joyfully welcome my return. They venerate Sentos the Righteous, the soldier who brought glory on all who dwell in Thune. But what of those who cry for Sentos the Merciful, the soldier who ended the war through an act of mercy unparalleled in a war-torn land? What of their eastern city with its ancient temples? They blessed me for sparing their Elder Sun King, a man of unnatural long life and wisdom. Their storytellers called me goddess-born. My mother, who nearly died bearing me, laughed to hear such foolishness. On a cloudless day, I can glimpse the legendary domes of An Karras in the distance, backed by the cerulean ocean. But it's night, cold and misty, and I see only shadows outside my open window. By choice, my world has narrowed to four things: A sleeping pallet. The empty desk at which I sit. The ring upon my finger. And the flask of poison. The ring came to me the day the war ended on Fleet Rock. The day I did not execute a man. The poison I obtained the day An Karras celebrated the scourging of the east. If I drink to righteousness, I end myself in the name of that great city on the western horizon. If I drink to mercy, I end myself for that eastern city now a shamble of charred stone. You could not draw a straight line between my heart and that devastation. But in the borderland, in this place where I am nothing but a man, it's my burden alone. So I'll lift the flask in praise of elder kings, to ancient temples, to tales of men who forsake glory. But I'll drink to oblivion. And rejoice as darkness falls. The wooden door of the cottage slammed open against a gust of wind, and the crash jerked Sentos out of his dark slumber. The empty flask of poison careened across the desk and shattered against the wall. He whirled around in his chair as the wind gusted again, blowing autumn leaves through the open door. Several black rats scurried over the threshold and hid behind the straw pallet along the wall. The torch on the far wall still burned, and it was still night. But is it the same night? On shaky legs, Sentos tripped toward the door, hoping to shut it against the chill, when something at the edge of the clearing caught his eye. He left the cottage and stumbled toward it. A statue? Gleaming white in the moonlight, the statue resembled one of the monks who lived in the keep. But the stonecutter had carved fear into the monk's elderly features. A strange way to show a holy man, Sentos thought. The monk's cottage was isolated from the main keep. There had been no statue before, of that he was certain. How could the monks transport such weight along the winding footpath that led to the cottage? He stumbled back inside, where he wanted to lie down and sleep. 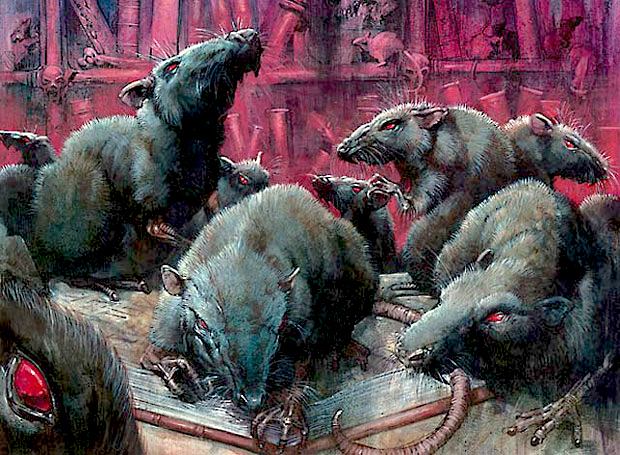 But what of the rats?And the broken glass? Has midnight come and gone? His thoughts felt too banal for a man who just opted for death over life. Back in the cottage he realized he was not alone a heartbeat before a cold blade was pressed against his throat. "Don't move," a woman's voice warned him. She sounded young, like one of the youth who lived in the village below the monastery. "Are you Sentos the Merciful?" She spoke with an accent not of Thune, but not of the east either. Shandalar was vast, and wherever she was from, it was unfamiliar to Sentos. "No." He could see the woman's shadow on the wall, backlit by the torch near the door. She was only slightly shorter than him, but then, he wasn't a very tall man. "Then who are you?" she asked. "Sentos the Not Dead," he said. She jammed the blade into his back, between his shoulder blade and his spine. He barely managed to not scream. Such a foolish assumption that a woman couldn't be deadly. "Sentos," he managed to say. The blade was still in his back. He felt momentary panic, like a clawing sensation in his belly. He wanted it out of him. He wanted it in her throat. "Tell me what happened on Fleet Rock. The day you ended the war." "I didn't kill a man," Sentos said through clenched teeth. Pain is just weakness leaving the body. She twisted the blade, and he felt a gush of warm blood release from the gap in the skin. She doesn't understand the mind of warrior. Once she makes me hate her, pain becomes irrelevant. "Use more words, Sentos the Not Dead," she hissed. 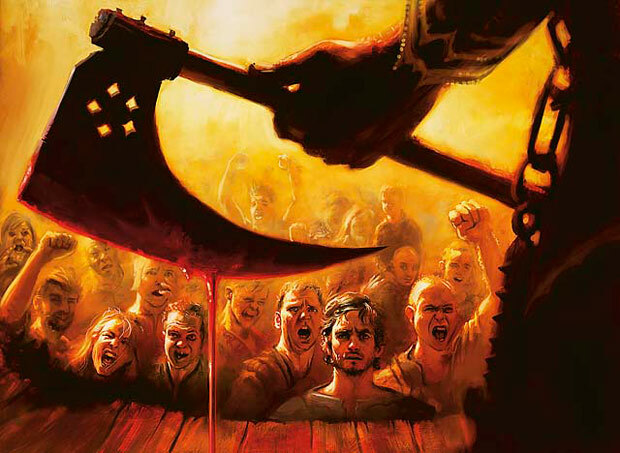 "They led a silver-haired man to the executioner's block. He looked like a vagrant from the streets of An Karras," Sentos said. "No one told me he was the false king." "So why spare his life?" she asked. Why, indeed? Because of the ring that is now heavy on my hand. Why? He offered me the ring to spare his life. Why? Because a ring for my pretty wife sounded better than a bucket full of blood and another head rolling across the floor. "Why torture me for an answer?" She was not an eastern survivor. An easterner would have murdered him for calling the silver-haired man a false king. She ripped the blade out from the left side of his spine and drove it into the right. But as fury warmed his chest, the pain disappeared. Oblivion could wait until he snapped her neck with his bare hands. He tried to spin around, but her grip was iron. Far stronger than he had expected, she slammed him down on the desk, his face grinding into the broken shards of the poison flask. "Because you have something I need." She pushed his head down with such force, it felt like the planks would snap under the pressure. "Why did you spare his life?" "Because it could have been me on that block. Or my son. Or anyone in the midst of that miserable war. I did it out of mercy." It was a lie he'd told many times before, and it flowed easily from his lips. She'll believe me because she thinks I want to live. "Was it your secret plan to use their surrender against them?" she asked. "Get them to lay down their weapons, then rip their throats out?" "No, my superiors saw an advantage where none had been intended." That was not a lie, and the words felt like pebbles on his tongue. No straight line between my heart and that devastation. "So what they say is true. You are a righteous man." Usually, when someone called him that, it was with deference. But he heard no respect or awe in her tone. "Does that give you peace?" Sentos asked, still hating her, still immune to the blade in his back, still watching her shadow on the wall. "Peace?" she scoffed. "I am cursed. A demon requires payment. He demands the eyes of a righteous man." She pushed back her hood, and her silhouette transformed as the writhing strands of her hair unleashed themselves. 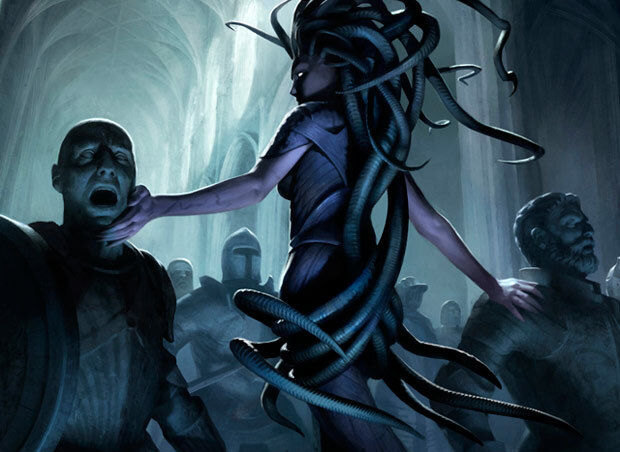 A gorgon, a monster of Xathrid, with the power to petrify a man with her gaze. Disgusted, he recoiled against her grip. If he glimpsed her face, he would meet the same fate at the monk in the clearing. Just a kindly man come to check on my fate. "Eyes of stone have failed me," she hissed. "Eyes of lesser men are insufficient. Your eyes will be my salvation." The instant she eased the pressure on his head, Sentos grabbed a shard of glass, whirled around, and plunged into her heart. Even before he removed the shard, black snakes poured from the wound. He scrabbled away from the flood of vipers, slipping and crashing to the ground. They swarmed over him, their fangs sinking into him and releasing venom into his blood. Desperately, Sentos rolled on his belly and crawled toward the door. Around him, the snakes that caught the gorgon's gaze turned to stone. With their fangs still deep in his skin, they weighed his body down as he inched toward the threshold. The gorgon's foot slammed into the back of his neck, pinning him down in the nest of petrified snakes. "How are you not dead? Are you not a man?" She crouched down beside him, yanking up his hand with such force that he heard his shoulder snap. "This ring? Where did you get this?" From the False King on Fleet Rock, that man of unnatural long life and wisdom. He offered me the same in exchange for his freedom. I didn't believe his lies. But I gave him his freedom for the trinket anyway. With her blade, she sliced off his finger, taking the ring for her own. "A ring that grants ceaseless life," she murmured. "Missing for so long, but here? In Thune?" Without the ring, the venom seized his heart. The blood flowed freely from his wounds. He struggled to breathe while the door seemed to plunge miles away from his reach. Escape is senseless. Instead, Sentos twisted his neck and gazed at the gorgon's face. She howled, slicing the knife down to take his eyes while he was still flesh. But he heard the tip of her blade meet the stone of his face. And rejoiced as darkness fell. 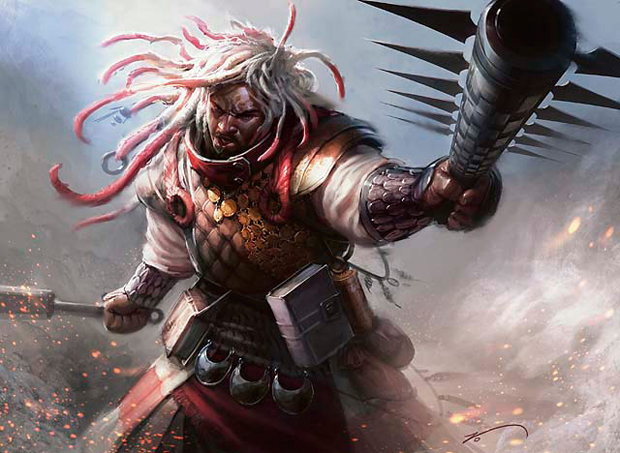 Xathrid Gorgon is the Magic 2013 Prerelease Card! Find out how to get your copy at Prereleases this weekend here!